Very few people these days are going to the landing pages for NPR blogs such as The Two-Way (for breaking news) or Parallels (for international news) to catch up on the day's happenings. If you're one of them, however, you're going to encounter some changes come June 5. NPR's newsroom staff has been reviewing the NPR blogs in recent months, in an effort to make it easier to find content on NPR.org. One result of the review is a decision to get rid of some of the news blogs. This is a change in how NPR content is organized. The same stories will still be reported and posted. But readers will find them in different places, and the stories will no longer carry those blog labels. Ditto for education; NPR Ed is going away, but the Education topic page remains. All Tech Considered is going away, but the Technology page will have all the stories. And The Record's stories will now be found at NPR Music. The Two-Way's termination is the biggest change. 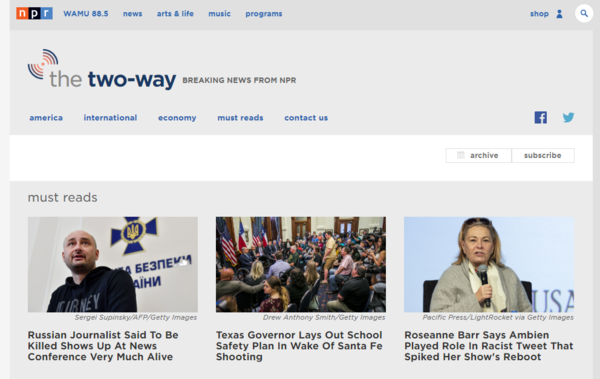 That blog and its dedicated reporting team started in May 2009, when NPR, then still primarily a radio operation, wanted to expand its digital presence. New reports from that team will end up on topic pages, not in one centralized place. Sara Kehaulani Goo, a managing editor overseeing digital news operations, said the moves follow the changing way readers are finding stories. They are far more likely to follow a link posted on Facebook than to start at the landing page of one of those blogs, she said. "At the end of the day, people aren't coming to us by topic or blog; they're coming to us by stories; they are very interested in story by story," she said. An audience survey showed many didn't know NPR had blogs. Some who did thought that those pages labeled "blogs" were more personal columns (such as the Ombudsman blog) than aggregations of news stories, she said, adding, "It became an obvious question then: Our audience isn't recognizing that we have these blogs, so why do we have 10 brands within NPR.org that aren't resonating?" "We kind of made it hard for our audience to understand what we were doing," Goo said. The changes are a first step in simplifying all that, and more blog changes are on the way over the summer and fall. "We're looking at other online brands and trying to find the best opportunities to strengthen the brands that we have and make it easier for readers to find content and connect with us more deeply," Goo said, but declined to offer specifics. One obvious place for change is with the blogs related to NPR podcasts. NPR isn't making it easy to find stories related to podcast content, either. To take just one example, the podcast and online content for Code Switch, the race and identity reporting team, is housed in two separate places online. While no one is losing a job due to next week's changes, Goo said another goal "is to help the newsroom work more collaboratively together." Blogs are good for internal newsroom organization (as a way to group reporting teams), she said, but "they also create silos," when teams jockey for who gets a story. "We really need to be more audience focused and reader focused at the end of the day," she said.